These were placed in my Christmas stocking, to my surprise and delight. The pearls are lovely, with a lovely pink sheen. The emeralds and rubies are small, but with great color. Nobody will mistake these for costume jewelry! I have received many compliments when I''ve worn them.They look fabulous when paired with Item # 19154--Genuine Emerald, Ruby, Sapphire & Pearl Necklace. My lady said she did not like ear rings that dangled but I had already purchased these. So while I was driving for a get away weekend. I told her that I had purchased her a pair of ear rings that dangled before I knew that she did not like that type. I wanted to show them to her so I had time to return them or get her something else. I opened the console of the car and gave them to her and she said, &quot;I LOVE THEM!&quot; She took off her other ear rings and put these on. She wore them all the way to the motel. At the check in counter of the motel I told her if she keeps wearing them they were going to turn into a souvenir instead of a Christmas present and I would have to buy her some thing else. She said that sounds good to her and she wore them for the whole weekend until we got home on Sunday night. So I got her another gift from Stauer. What a charming combination and so dainty and pretty when worn. Bought with the matching earrings and makes a truly lovely set. The color combination is different and very complimentary. On sale, a nice deal. When I saw these earrings, I could not resist and I placed the order. The shipping was very fast and I so like them. They are delicate, elegant and so classy. Thank you! Gave these to my sister and she wore them Christmas Eve. Beautiful. Not traditional "Christmas" jewelry but a perfect holiday accent that can carry over to other seasons. The moment only comes once. You hand her the box and maybe she gives it a little shake. She tugs at the end of the bow and it unravels. Before she opens the box, time stops. You sit wondering, "Will she like it? In another half second, you'll know, but the anticipation is overwhelming. Before she says a word, her eyes speak clearly. You got the perfect gift. Stauer’s Emerald, Ruby & Pearl Earrings have prompted the three words you wanted to hear, "I Love them!" “I just don’t know how you do it. It’s like you read my mind! 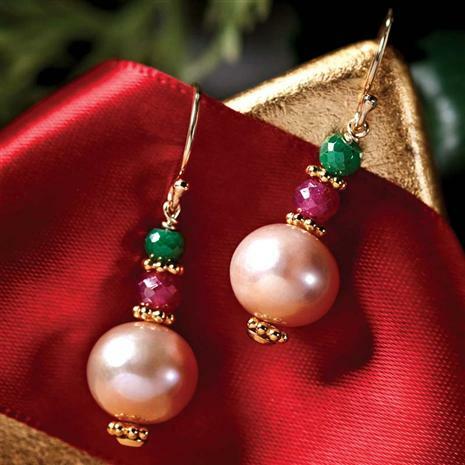 Pearls… Rubies… Emeralds…. You shouldn’t have.” But her kiss lets you know she’s glad you did. 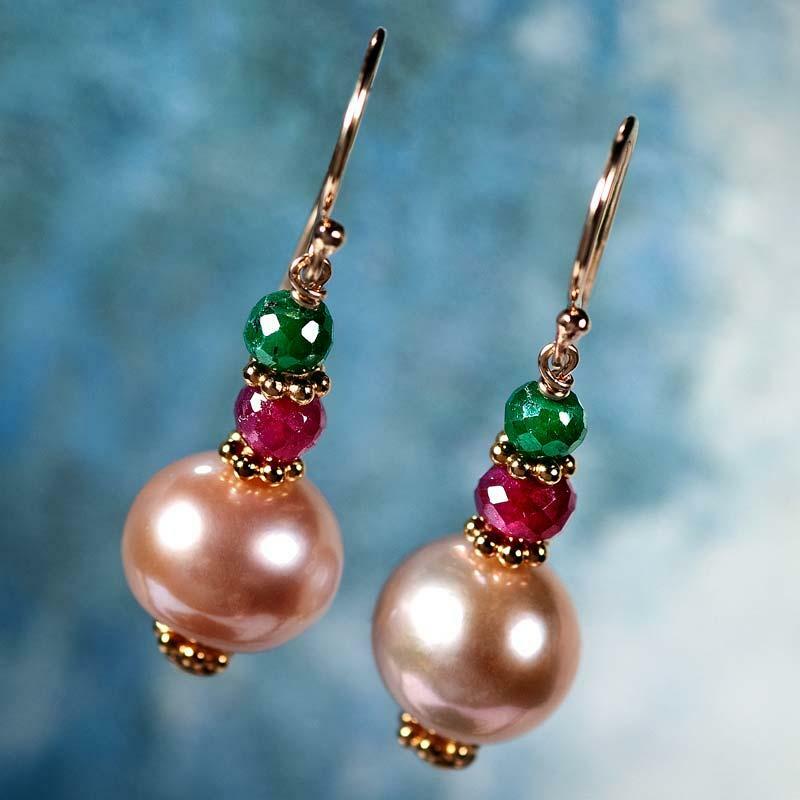 Our Emerald, Ruby & Pearl Earrings feature a luminous, pink freshwater pearl topped with sparkling, faceted beads of genuine ruby and emerald. Each precious trio dangles from sterling silver French hooks finished in luxurious gold. It’s hard not to resist some of the most prized substances on Earth. These precious materials have captivated kings, queens and explorers from the beginning of time. But you, you’ve just proven that you know that there’s nothing more precious than her.